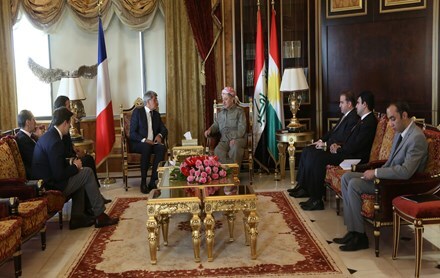 Salahadin, Kurdistan Region of Iraq, (Krp.org)- President Masoud Barzani received a French diplomatic delegation headed by ambassador Bruno Aubert, the ambassador of France to Iraq. During the meeting, President Barzani and ambassador Aubert spoke of a number of issues including the excellent bilateral relations between France and Kurdistan as well as the Kurdistan Independence Referendum. President Barzani made reference to the importance of the relations between France and Kurdistan and how France has historically been supportive of the cause of the people of Kurdistan. The Kurdistan Region, President Barzani stated will eternally keep in its memory the assistance that has been provided historically by France. Ambassador Aubert also said that the relations between France and Kurdistan are of great meaning to the people and government of France. He also added that the government of France is not, in any way against the right of the people of Kurdistan to cast their votes in the referendum for independence, however, he added that the government of France objects to the timing of the referendum. President Barzani stated that the decision is no longer in the hands of any political leader, rather, it’s in the hands of the people of the Kurdistan Region whose rallies in the past months have clearly demonstrated their passion for an independent Kurdistan. The President added that the referendum has already started in the diaspora as hundreds of thousands of Kurds across the globe have already begun casting, or will start to cast their votes. On September 25, the President said, the people of Kurdistan will be engaged in a peaceful and democratic exercise where they will decide whether they want to remain part of Iraq or separate. The President also added that the referendum will not have any negative impact on the international effort against the terrorists of the Islamic State.